A cyclonic filtration unit that periodically releases material on scales through pneumatic valves. A LabVIEW program responsible for condition monitoring, data acquisition and report generation. This project enabled Heijmans to increase the number of tests from 4 to 7 each week. The RSAT is one of the methods selected for the DRaT project. DRaT is an acronym for Development of Ravelling Test and part of a CEDR Transnational Road Research Programme. 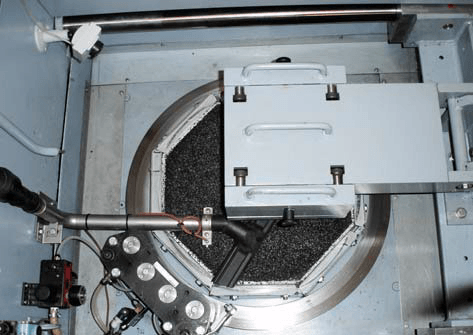 Other methods are DSD (Darmstadt Scuffing Device), TRD (Triboroute Device), ARTe (Aachener Ravelling Tester) and SR-ITD (Skid Resistance & Smart Ravelling – Interface Testing Device. Because of the early involvement of Somatidio with ravelling tests, our many years of experience and the fact that we are an independant engineering company we are the ideal partner for assisting you in developing or automating your (ravelling) testequipment. Interested in asphalt or pavement degradation mechanisms? Check out this comprehensive list. Questions related to asphalt raveling, RSAT, SR-ITD, ARTe, DSD, TRD and DRaT? Contact us! Vragen over asfalt rafeling, RSAT, SR-ITD, ARTe,DSD, TRD en DRaT? Neem contact op!